Such is the fragility of the political system in Britain that it only takes a few words in the shape of an indicative ruling by the Speaker of the House of Commons to spark off what the government’s Solicitor General has described as a “major constitutional crisis”. Leaving aside what a minor crisis would look like, the explosive reaction by Robert Buckland and others to John Bercow’s ruling that the government can’t bring the same Brexit motion back to Parliament is only the latest sign that the system is effectively broken, almost certainly beyond repair. But what is a constitution and what does the UK’s look like? How is it in turmoil and why does that matter? Finally, what are the origins of the present crisis and what are the potential solutions? According to the constitution unit at University College London (UCL), “constitutions… simultaneously create, empower, and limit the institutions that govern society”. Virtually every country in the world has a written constitution, a document, often with amendments, that can be identified and referred to alongside a constitutional court. Note that, taken together, the “institutions” referred to by UCL form what is essentially the state which includes more than Parliament, embracing the armed forces, the judicial and penal systems, intelligence agencies, the Bank of England, the civil service and a variety of quasi-governmental bodies and agencies. They all “govern society” in one way or another, retaining the power to enforce decisions by force if necessary. If the arrangements for governing society are in crisis, and they obviously are, it matters to everyone. Political turmoil can, if unchecked, lead to breakdown and worse. With increasing numbers of voters alienated from the political system, the fragile connective tissue between people, constitution and the state could break down altogether while forces outside of the mainstream jockey to fill the vacuum. The constitutional and the political have merged in the present crisis. Both major parties are divided over Brexit almost like mirror-images of each other. Some Labour MPs have quit to form the so-called Independent Group. While the Tories have the European Research Group, who favour a kamikaze-type no-deal Brexit, Labour’s deputy leader Tom Watson has formed a centre-right parliamentary group in opposition to the leadership of Jeremy Corbyn who has the support of the membership. Parliament as a whole is opposed to leaving the European Union in line with the 2016 referendum result. As a result, the government, also known as the executive, has yet to persuade the House of Commons to endorse the so-called withdrawal agreement. 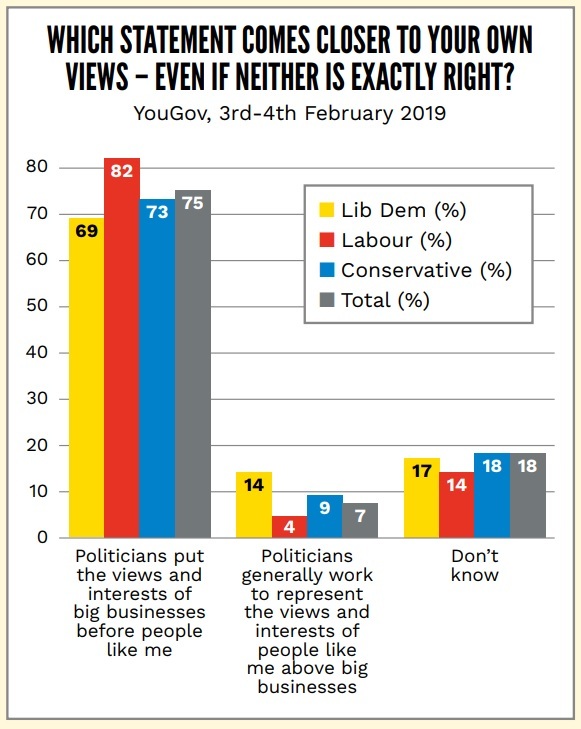 Yet neither Labour nor the Tories want to be seen as the party that proposes that Article 50, the formal notice that the UK would be leaving the EU, be revoked and the referendum result ignored. It is hard to see how an extension of the March 29 departure date being sought by the prime minister will resolve this deadlock. Meanwhile, the government is on the verge of losing its power and authority to rank-and-file MPs (which they haven’t had since the mid-19th century before the creation of disciplined political parties and modern forms of government). 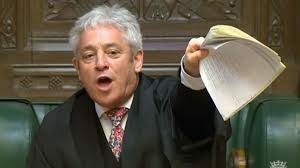 In this mix, the pompous Bercow cites a precedent that goes back to King James 1 (1566-1625), who reigned before parliamentary democracy was founded, for his ruling. Yet only last month Bercow, who is a known Remain supporter, broke with precedent and allowed an amendment to a government statement on the business of the Commons. Neutral he is not. Meanwhile, according to the UCL’s latest bulletin, “non-Brexit business within government is paralysed, and legions of civil servants from across Whitehall have been diverted to Brexit preparations”. In other words, the capacity of the state to deal with the Brexit process has been called into question and found wanting. So there is, in effect, a combined constitutional-state-political crisis! For a country like the UK, with its long political history and still one of the world’s largest capitalist economies, this is quite a moment. Undoubtedly the vote to leave the EU has brought matters to a head. For a start, the result itself was effectively a rejection of the existing constitutional arrangements between the UK and the EU. A narrow majority wanted to end the constitutional relationship whereby, in terms of parliamentary sovereignty, the UK is subordinate to EU law, for example. That was not the outcome the mainstream political parties wanted. They all campaigned for Remain, believing it to be a foregone conclusion. Little was learned from Scotland’s independence referendum when the more feverishly the Westminster-based parties pushed to preserve the Anglo-Scottish union, the more the ‘Yes’ side built its momentum. Since then the nationalists have dominated Scottish politics, pushing Labour into third place in the polls. But the 2016 Leave vote had a deeper significance. While anti-immigration sentiments played a role, the predominant cause established by researchers was a sense for millions of workers outside of London that a rejection of the status quo was worth taking a chance on. For people living in communities where regular jobs had disappeared, council services had been cut to the bone under austerity and wages had plummeted, where was the benefit in remaining in the neoliberal EU would-be superstate? Perhaps leaving the EU might provide a solution? It was a shot in the dark born out of desperate circumstances. Many had stopped voting for Labour before Corbyn became leader and felt no incentive to follow his recommendation to Remain. But the aspirations of the 17.4 million who voted leave could never be met by the present Parliament and constitution. Even if there is eventually a deal to leave, it won’t be on terms that will enhance jobs, wages and living conditions. How could it be? The political system predominantly represents corporate interests first and everyone else’s a long way second, if at all. If today the UK’s constitution is at breaking point it is essentially because it cannot satisfy the hopes of working people, whichever way they voted in 2016. Because it is a capitalist type of state, it can neither tackle climate change in any meaningful way or redress the gross inequality that disfigures the country. In the grand, neoliberal capitalist scheme of things, that’s the way things are. There will always be winners and losers. While winning the right to vote was a major achievement by the mass of the people over more than a century of struggle, neoliberal globalisation has emptied out the present system and undermined its legitimacy and increasingly its authority. Decisions about people’s lives, jobs and communities are more often than not simply handed down. This is still representation – but without the modest power that the vote once embodied. However, it would be wrong to rejoice in the present crisis without having an alternative in mind in terms of a new, democratic constitution and state system. Such a constitution would aim to advance democracy on the grounds that the present system cannot be the last word on the subject. A democratic constitution would become the basis of a different kind of economy, one that ends exploitation for profit and works on a co-operative basis to address human requirements, focusing on measures to meet the ecological crisis. The initiative for what amounts to a democratic revolution must come from the people themselves. The present political class has little interest in new arrangements that might leave them marginalised. That said, a new constitution would have to preserve and enhance historic achievements including the rule of law, the right to vote, freedom of speech and assembly and other human, cultural and ecological rights. Some of these ideas are developed in Time’s Up for Neoliberalism published by the RDM in 2018. A movement for a citizens’ convention on the constitution would set the ball rolling in the right direction. The convention would be charged with developing, in collaboration with sympathetic experts, a new constitution and state framework. Ideas of how a convention might work have already been developed by UCL’s constitution unit, for example, while others are engaged in similar projects. A convention on the constitution was included in Labour’s last election manifesto. Corbyn and John McDonnell could do worse than campaign for one right now. There is little time to lose. We should redouble our efforts to make the issue of a democratic constitution at the top of everyone’s agenda together with a wide-ranging discussion about how we achieve it.